There exists the occasional time here and there were things considered supernatural appear and it just cannot be explained. Much of the time its touted as a hoax, which tends to regularly be the excuse when we don’t understand what we see in front of us. If you haven’t see this video yet, take a gander. You might have a different opinion than the regular excuse. What happens in the security footage of a hotel can only be described as extremely phantasmal, extremely disturbing and somewhat violent. The footage reveals how a woman on her phone is caught in a room when a supposed ghost starts tossing tables and chairs around. 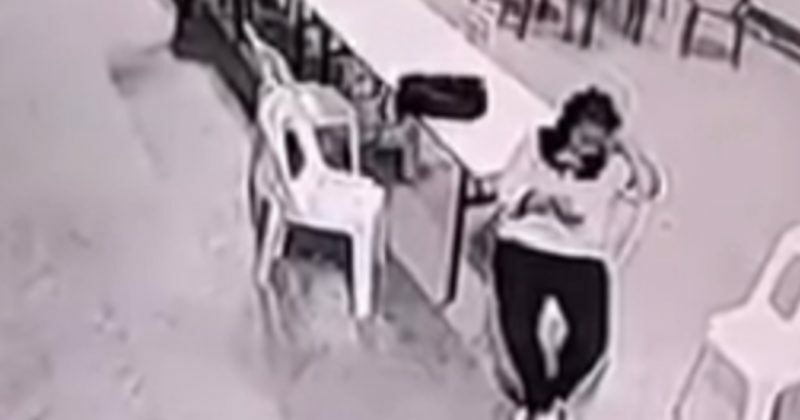 The grainy black and white security footage opens with what appears to be the shape of a woman sitting in a chair by a plastic table, using her phone. The bed is located in what reports are saying is a large room in a hotel in Malaysia. Soon enough, you find your eye wandering to the chair that just slid all by itself. The woman jolts up, freaks out and is then seen using her phone to frantically call for help. But before long, a chair that’s right in front of her slides as well, which causes her to jump out and run away. As she tries to leave the room, chairs and tables are flung to the door blocking her in. What happens next? Find out for yourself. It truly is an eerie sight, but there seems to be a problem with the video. Nothing that happens in the video explains anything. What does happen (the tossing around of furniture) can be easily had. There was no levitation, or anything to suggest that it would be impossible to replicate all this with a good team of dedicated pranksters or horror movie technicians, hell, even dedicated teenagers. You can make the call yourself, but as for me, I’m calling bull crap on this one, my friend.